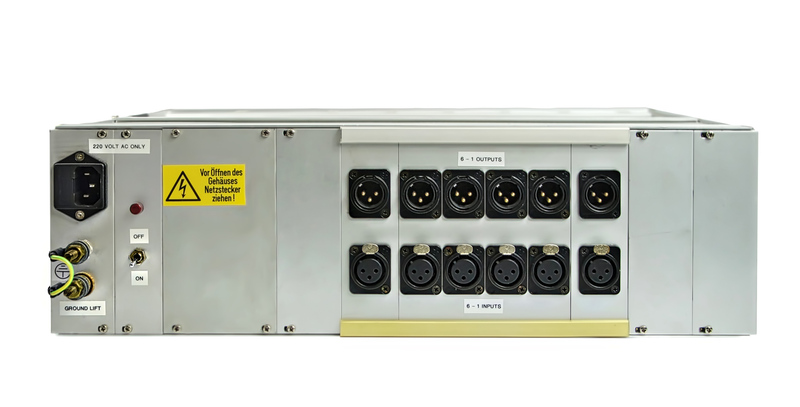 EMT / abe 6-Ch 19" 3ru dynamics rack with hi-quality limiters. This 19" 3ru rack comes with an internal power supply, six of the legendary dynamics, which can be used independent from each other or linked to stereo or multi channel groups, XLR in and outputs and a full 12 month dealer warranty on vintage gear. This is a collectors item you won´t find a second time anywere. Stereo mic preamp with 80dB gain, based on a vintage LAWO card. Mono mic preamp with 80dB gain, based on a vintage LAWO card. 19" 3RU rack, ready for 8 TELEFUNKEN V672 modules.